Italy's Highest Court Overturns Amanda Knox Conviction : The Two-Way The decision puts an end to a story that began in 2009 when Knox was found guilty of murdering 21-year-old Meredith Kercher two years earlier. 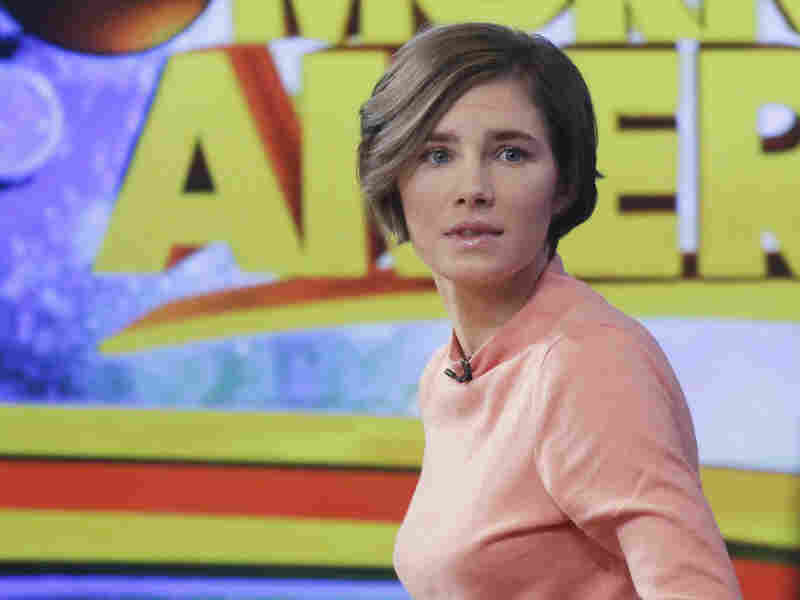 Amanda Knox prepares to leave the set following a television interview on Jan. 31, 2014. Italy's highest court has overturned a murder conviction in the case of Amanda Knox. The court's decision puts an end to a story that began in 2009 when Knox was found guilty of murdering 21-year-old Meredith Kercher two years earlier. The verdict was overturned in 2011. But a year later, the Court of Cassation overturned the acquittal and sent the case back to an appeals court in Florence. Last year, that court reinstated the original guilty verdict against Knox and her ex-boyfriend Raffaele Sollecito. As NPR's Scott Neuman reported at the time of the verdict in Florence: "The latest ruling reinstates the initial verdict and sentences Knox, who currently lives in Seattle, to 28 1/2 years in prison and is likely to set up a long battle over her extradition." Knox, who left Italy after the verdict in 2011, now lives in Seattle. She told NPR in an interview in 2013 that the Italian Supreme Court's decision was looming over her. It's this "horrendous thing that just never ends," she said. "I do not think that I will be convicted because there just simply is not that evidence. I just simply did not do it. I feel like I'm having to prove my innocence as opposed to have the prosecution prove my guilt." Reuters reports the court also acquitted Knox's then-boyfriend, Raffaele Sollecito. In an earlier version of this story, Meredith Kercher's name was misspelled as Kirchner.